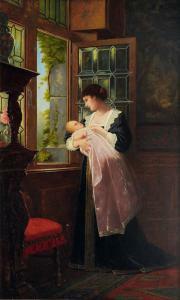 Find artworks, auction results, sale prices and pictures of Ernst Anders at auctions worldwide. 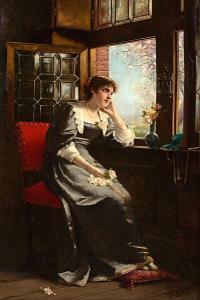 Junge Dame am Fenster. Öl auf Holz. 37,5 x 56cm. Signiert oben rechts: E. Anders. Rahmen. 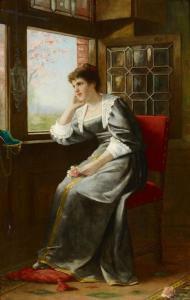 Young Woman at the Window. Signed upper right: E. Anders. Oil on wood. 56 x 37,5cm. Framed. Oil/wood, 54 x 33 cm, up. ri. sign. E. Anders. 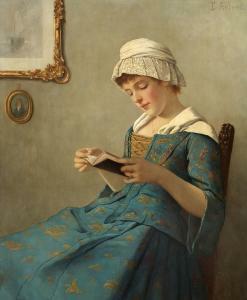 - German figure a. history painter, studied at the Düsseldorf academy 1861-68, until 1872 he took lessons with W. Sohn, was member of the Düsseldorf artis's group 'Malkasten'. - Lit. : Saur, Boetticher, Thieme-Becker, Vollmer, Bénézit. Mis: 68.5 by 45.8 cm..
Canvas not lined. Surface in good condition; under a glossy but dark varnish. Under UV light: selective cleaning and therefore very spotty varnish, very difficult to detect inpainting.We are pleased to provide you with a general report of the condition of the property described in our catalogue. Since we are not professional conservators or restorers, we urge you to consult with a restorer or conservator of your choice who will be better able to provide a detailed, professional report. 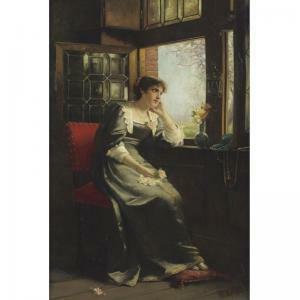 Prospective buyers should inspect each lot to satisfy themselves as to condition and must understand that any statement made by Sotheby's is merely a subjective, qualified opinion. NOTWITHSTANDING THIS REPORT OR ANY DISCUSSION CONCERNING CONDITION OF A LOT, ALL LOTS ARE OFFERED AND SOLD "AS IS" IN ACCORDANCE WITH THE CONDITIONS OF BUSINESS PRINTED IN THE CATALOGUE.